Lost among the latest laptops, smart assistants, VR headsets, and Motorola-branded gadgets that it brought to CES 2018, Lenovo has also introduced a new pair of augmented reality smartglasses. While Lenovo could be credited with the first true consumer AR headset by way of the Lenovo Mirage for the Star Wars: Jedi Challenges game, this time around the company is returning its focus to enterprise customers. Lenovo New Glass C220, an update of the C200 model unveiled last year, consists of a glass unit tethered to a pocket unit. 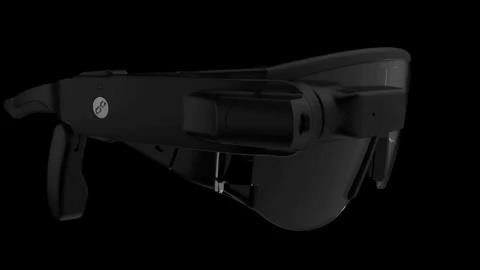 Weighing less than 3 ounces, the glass portion is comprised of an adjustable head-mounted monocular display and 1080p camera that can be mounted on either the left or right of the safety glass frames and bone conduction speakers. 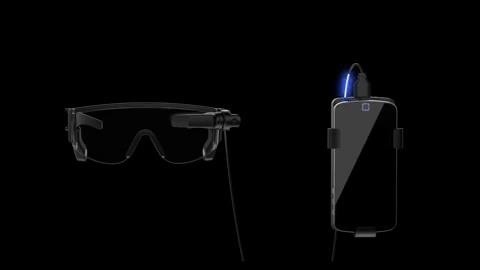 The pocket unit, a massive 8,000 mAh battery pack and smartphone dock, connects the C220 to an Android smartphone, which gives the smartglasses processing power as well as a data connection. For software, Lenovo includes its enterprise platform, Augmented Human Cloud, from its AR-focused subsidiary, Lenovo New Vision (LNV). When installed on the tethered, the LNV app provides workflow guidance, video communication, and object detection for its users. Despite its growing prominence in consumer electronics, it's easy to forget that Lenovo has a sizable enterprise division that competes with the likes of Dell. As smartglasses for enterprise go, this option is particularly attractive to companies who already issue Android smartphones to their employees. However, with their demonstrated experience in AR, both in executed products like the Lenovo Phab2 Pro and conceptual products like the daystAR headset, along with their global scale, Lenovo should be considered a dark horse as the company to bring the first truly mainstream consumer headset. But, dear consumer, these aren't the smartglasses you're looking for.